Dilek Peninsula National Park in Kusadasi ( Dilek Peninsula – Great Menderes Delta National Park) is among the most important natural heritages of Turkey, with an area of ​​27.598 hectares. Dilek Peninsula, declared in 1966 as a national park, covers 10.985 hectares. Great Menderes Delta, declared in 1994 as national park, covers 16.613 hectares. The national park can be reached via the Kusadasi (Kuşadası) – Soke (Söke) highway, and lies roughly in the middle of the two towns. It is possible to stay in the national park in tents or caravans, and there is food available. Dilek Peninsula National Park in Kusadasi has extraordinary beauty of Mediterranean flora with blue and emerald colored clean beaches. Dilek Peninsula National Park covering 10.985 hectare area at Dilek Peninsula is situated on the south of Kusadasi (Kuşadası) near Davutlar and Guzelcamli (Güzelçamlı) in the province of Aydin (Aydın). This mountainous land is divided with canyons and valleys. Dilek Peninsula including sandy, pebbled, horizontal and high coastal formations as well as such canyons and valleys, embrace natural, historical and cultural values. Besides its interesting geological formation, Dilek Peninsula National Park has a rare Mediterranean flora. Dilek Peninsula National Park in Kusadasi also offers walking and climbing paths inside the forest for trekkers. Except daily facilities, no overnight facilities is allowed in the park to protect natural environments. Nature photography, Best preserved Mediterranean maquis flora, Natural plant and animal communities, Recreation, Geology, Beaches of Dilek Peninsula are popular in summer months. Regional Office: 4th District (Manisa), Province: Aydin, Town: Kusadasi, Coverage Area: 27.598 Hectares, Coordinates: 37°40’08.14” N – 27°09’42.32” E, Height: 500 m.
The Delta of Great Menderes covering 16.613 hectare area, is situated on the south of Kusadasi. Great Menderes Delta is one of the most important habitat in the Aegean Region for migratory birds. Great Menderes Delta is also the spawning ground of marine fishes. The route of Great Menderes Delta runs along a unique pastoral landscape. 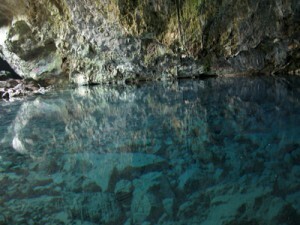 The national park offers many alternatives for visitors to choose from. You can swim from beaches where the forest trees come right up to the water, go for a walk amongst the linden and chestnut trees, cycle through pine woods, go rock climbing, or fishing for example. Among the many rare and endangered bird species which can be seen in the park are the Dalmatian pelikan and pygmy cormorant, and if you are lucky you may catch a glimpse of wild horses. The vegetation of the peninsula is as varied and interesting as its fauna. Dilek mountain (1237 m), creating significant temperature differences between the south and north sides of the peninsula. This means that plants belonging to no less than four different regions are to be found in close proximity here. As well as typical Aegean vegetation there are many plants normally more at home in the Mediterranean, Marmara and Black Sea regions. Red pine (Pinus brutia), Phoenician juniper, sumach, a variety of wild pear (Pyrus elaeagnifolia), myrtle, cornelian cherry, oak, chestnut, linden, ash, and many more species coexist here. The sections where lagoons and wetlands are produced on the south of peninsula at Great Menderes Delta has international characteristics and the lagoons where the fresh water mixes with the salty water contain rich biological varieties in its structure. 209 different types of bird species can be found in this rich ecosystem and is not only an extremely important nesting area for the endangered Dalmation Pelican but it is also a safe environment for the pygmy cormarant species. Due to its clean environment, breathtaking views and clean beaches, Dilek Peninsula National Park is the perfect place to have a picnic. There are facilities on offer such as benches, picnic tables, toilet and shower facilities. If you don’t fancy a picnic there are also cafes available. The boat trips from Guzelcamli and Kusadasi go in the complete opposite direction and head into the crystal clear waters of Dilek Peninsula National Park and close to Greek island of Samos. Beautiful bays and coastal scenery, rich marine life can be seen in this boat trip. If you’re lucky you can even see dolphins. The Cave of Zeus at Dilek Peninsula National Park entrance contains a pool of fresh water, and many visitors to the national park stop here to shower on their way home. Legends about the cave are diverse. Some say, on account of the name, that Zeus bathed here, and others that the Virgin Mary did so. As the house where she is supposed to have lived the last days of her life is near Ephesus, not far away from here, this is not as fantastic as it seems. The south shores of the Dilek Peninsula are another world, with the wetland of the delta where flamingos and 208 others species of bird are to be seen at different times of year, including the Dalmatian pelikan and pygmy cormorant I have already mentioned. Of these, 76 species breed here. Wild boar are to be seen, some so used to human beings that they venture right down to the shore to beg for pickings like water melon peel which they will eat from your hands. Some visitors are also lucky enough to catch a glimpse of wild horses in the hills behind. The legendary Anatolian leopard was last seen in the flesh here, but for the past 30 years there has not been a sighting. 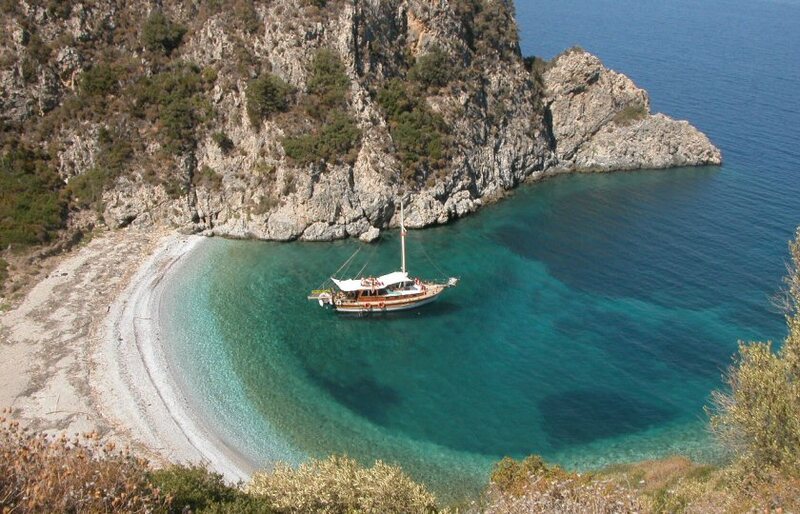 Dilek Peninsula – Great Menderes Delta National Park in Kusadasi is one of the wonderful places on the World. Ruby blue of sea, bright sun with beautiful nature.